This beauty was given out at a Capitals game on November 8th, 2001 versus the Carolina Hurricanes. 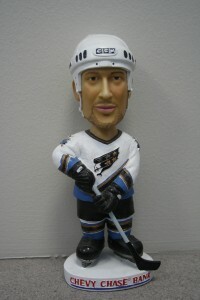 It was sponsored by Chevy Chase Bank, and was assigned a retail value of $25. Yeah, good luck with that. 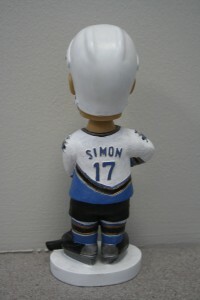 It was given out at probably the height of the Bobblehead craze in Sports, and just a few years before Chris Simon went crazy and started trying to hurt people on the ice. Still, it is a proud member of my Caps memorabilia collection. Do you have one of these, or something like it? How about something better? If so, send us an e-mail at [email protected] with a photo and description of your Retro Stuff. We’ll feature it in an upcoming post, so that we can all share in the memories.